Qaphela Gobodo was only 15-years-old when he received a scholarship for his favourite sport, rugby. His life was about to change forever, and this would set him up to play professional rugby in the future, however, tragedy struck after he received the good news. 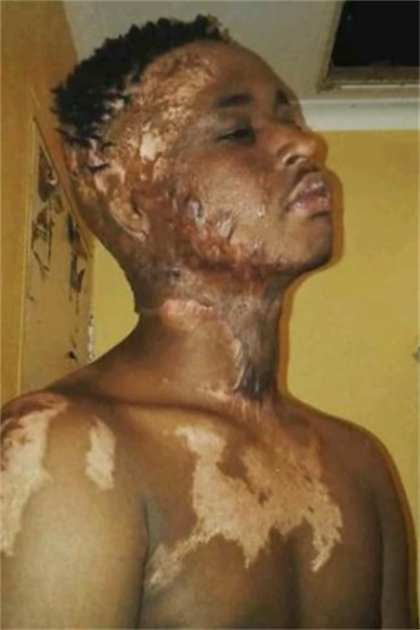 He was set alight by schoolmates and almost lost his life. “The day my life changed forever was a Tuesday in 2016. I was at school and I asked my teacher for a bathroom break and she agreed. As I was headed to the bathroom I saw these boys on the corridor but I didn’t mind them. When I left the bathroom someone hit me with a golf stick at the back of my head and I fell, unconscious. I couldn’t hear anyone; I couldn’t see anything and I couldn’t scream for help because I was unconscious. As I regained my consciousness I could feel myself burning but I was so lost because I thought maybe I had been shot or maybe I was dreaming but I couldn’t really understand what was happening. When I realized that I was on fire, I tried standing up but I fell again and rolled down the stairs while on fire. I was close to the girl’s bathroom and so I tried pouring water on myself but that just made the fire worse and also I had dye on me so I was burning even more. Everyone started screaming and crying so I ran out the toilet. The wind was also blowing which made the fire even bigger. My main focus now was getting to the headmaster’s office. It was about 3 minutes away so as I was running there, I kept falling and standing up again just to get to the office. When I finally got there, I asked them to open the water and then I knelt in front of the tap and the water quenched the fire. My clothes were stuck on me so I decided to take them off and I was naked. Everyone could see my private parts. My dad didn’t have any faith, he was going crazy but I encouraged him. I was still in pain when I was talking to him and everyone in that room thought I was dying. No one had hope that I’d survive but I did have hope that I was going to survive. I knew I wasn’t dying and I know that God was with me at that moment. The ambulance finally arrived after 30 minutes. The ambulance took me to Paarl General Hospital so when I arrived there; my mother told me that we had to wait till 12 midnight so I could be taken to a bigger hospital. The helicopter came and then I was taken to Tygerberg Hospital. I was in ICU and fell into a coma for about 26 days. When I woke up, I didn’t know where I was, I felt like I was dreaming. I remember the first time when I was going to see myself in the mirror. In my head, I thought maybe everything is normal and not much damage was done but as I saw myself for the first time, I was frightened. I was scared of myself. I felt hopeless. The hospital staff treated me with kindness. In my ward, I was the worst burnt patient. I had more than 20 operations. It was a really tough time for me. I was discharged from hospital in December and my friends came to see me. At first they found it hard to believe that it was me but as days went by they kept coming to visit and got use to me. They stayed in with me even during the December holidays when others kids went out they stayed with me and supported me. In January, I had to go back to school and I was really excited to go back. So on the first day of school people were saying bad things about me, people were laughing at me even my friends and people I was close with but I didn’t mind them. When I got back home from school, I told my parents that I’m not going back and that I wanted to take a gap year to recover and to think about what I want in life.